For those who want to attack Israel over the "occupation," Hebron is not invisible - it is the alpha and omega of everything evil about Israel. There are thousands of articles, videos and photos of Shuhada Street, the tiny part of Hebron that Arabs no longer can easily live in since the 1990s. To say that the stories of Hebron are untold and unheard of is ridiculous. Both of these tours - from Issa Amro and Breaking the Silence - are critical of Israel, of "settlers" and of the idea of Jews living in their second holiest city. 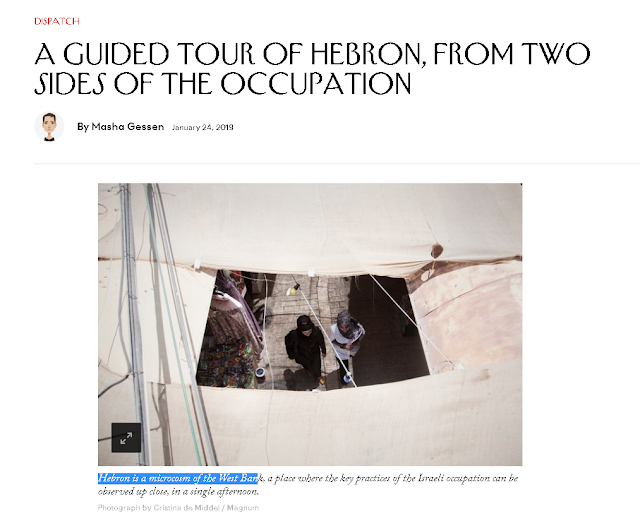 The article frames going to both tours as showing all sides of Hebron from the Israeli and Arab sides - and this is not even close. Because the author didn't bother to speak to a single Jewish resident of the area. I have. I've visited the apartments of Jews who live in Hebron. I have seen the bullet holes from Arab snipers that are still there. I have spoken to relatives of those killed - not only in 1929 but after Jews returned to the city after it was ethnically cleansed. In 1997, as part of the Oslo peace process, Israel and the Palestinian Authority drew a line splitting Hebron in two. The area designated as H-1 is controlled by the Palestinian Authority; in H-2, the Palestinian Authority has civil administration over Palestinian residents and the Israeli military controls everything else. H-1 is far larger, and in the past two years its population has roughly doubled, while H-2’s has dwindled because settler violence and I.D.F. restrictions have made life unbearable for Palestinians. But H-2 contains the city’s historic center, its most popular square, and its wholesale, vegetable, spice, and other markets—all of them now hollowed out. Gessen here briefly touches on, and then ignores, the salient fact that Hebron itself is a huge, bustling, successful city where Arabs flock to live - and where Jews are forbidden to live in practically all of it. But the vegetable market is now closed. Why is that? From reading the article one would think it was because Israel simply wants to grab land it has no rights to. Any excuse is used to oppress Palestinians. But for the residents of Hebron, the memories of the terror attacks are real. Jews walking home from prayers on a Friday night ambushed and slaughtered in 2002. An infant who was shot by a sniper, specifically aiming for her, in 2001. How many articles have you ever seen that humanize the Palestinians of Hebron - and how many that humanize the Jews who live there? And this is only one of dozens killed by Palestinian terrorists in the area over the years. Gessen isn't interested in speaking to Rabbi Ra'anan's daughter. No one is. The only people that the world media is interested in are the Arabs. The Jews who heroically want to maintain a presence in the holy city of Hebron, where Jews lived for 1500 years before Islam even existed, are the ones who are silenced. You can legitimately discuss whether Palestinians should be treated better in Hebron, but articles like this commit two crimes: they only tell one side of the story, and they pretend that Hebron is somehow a microcosm of the West Bank when in fact it is the only place (outside Jerusalem) where Arabs and Jews live in such close proximity. And when that happens, it is the Jews what need protection far more than the Arabs. If the Arabs would have left the Jews alone, there would be no army there. That is the real story, and it is one that The New Yorker will never touch.